According to a report from SeaWorld Orlando, Kunik, one of the young orca whales at the theme park, managed to escape from its tank earlier this week and disappeared. Now, rescue workers believe the orca has managed to drag itself over 600 miles north along the highway and into the woods, where it’s currently hiding. Escapes are rare at SeaWorld, and by the time Kunik’s trainers realized what had happened, it was too late. His trail of moisture had quickly evaporated, but a partially devoured deer carcass near where Route 1 meets I-95 put rescue workers back onto the scent. 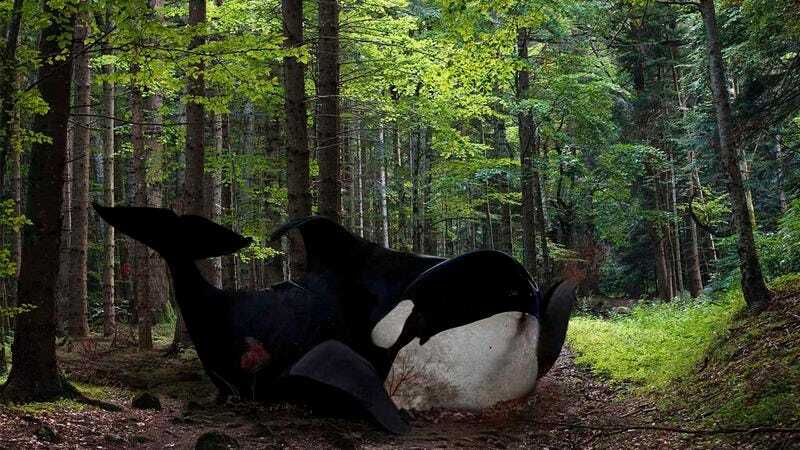 By following the path of flattened saplings and the occasional chunk of blubber, they were able to track him as far as Raleigh, NC before losing the trail in the thick Carolina woodland. Though SeaWorld staff remain hopeful for Kunik’s safe return, it’s hard to be optimistic. The going’s been slow, with a lack of trails forcing rescue workers to search on foot and the thick foliage obscuring him from helicopters. And while Kunik has shown extraordinary tenacity, the delayed response may have cost him precious time. Still, the trail hasn’t gone completely cold. A pair of hikers reported spotting him rolling downhill through the underbrush in the vicinity of Fayetteville, NC. Kunik had unfortunately moved on by the time the authorities arrived, but every sighting brings him closer to rescue. If you have any information that will help bring him home, contact SeaWorld Orlando at 1-888-800-5447 immediately. We’re praying for you, Kunik!